This weekend marks the official beginning of the summer in New Jersey. The beaches open and everybody is planning on heading for the Jersey Shore this long holiday weekend. Well, not everybody. Some of us will be staying behind and yet others will be taking advantage of the beautiful warm weather by having barbecues and family get togethers. But I'm envious of those heading to the shore this weekend! 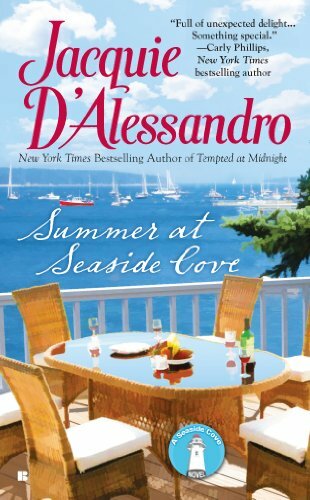 I've been reading Jacquie D'Alessandro's contemporary romance book, Summer at Seaside Cove and I can almost smell that sea salt. I want to feel the sand between my toes, take a walk on the beach and hear the waves roar in the evenings. Nick and Jamie are killing me! I wish I were at that beach in Seaside Cove romping around the waves with a dog, playing catch with a tennis ball on a beautiful day with a gorgeous dog like Nick's Godiva. Sigh... I dreamt about it last night. 83º sounds perfect to me. It's suppose to be 101º here today. So I'll either be inside or in the pool. Looking forward to your review on this one. Not sure if I've ever read this author before. As for Summer at Seaside Cover, you did a great job at selling!! I really want to read it now!! and I've been trying to be such a good girl and wait till RWA! Awww, his dog is named Godiva? How cute! and 83 sounds about nice, we are in the mid 90º, in the middle of the city!!!!!!!!!!! I'm baking in my clothes, I swear. Anyway, the book sounds good. I've only read historical romances by D'Alessandro. One a long time ago and a recent short story in an anthology. This contemp is new for me. Nath, you're getting the weather we had a couple of days ago! It's a gorgeous, hot day and it looks like it's going to be a gorgeous, hot week coming up! It's about time. LOL on my selling this book... it wasn't my intention, but I'm really enjoying this aspect of the book and wanted to share it. *g* I think it's a perfect summer read. It certainly made it to 83 today. At least that's the temp right now, but I bet it was a little hotter earlier in the day. The heat index certainly is higher.. but so glad to see the sun after such a wet, dreary month. My teen went to the shore this weekend with one of her best girlfriends, the girls parents (of course!) and four other girls. I even let her skip school today! OMG I never thought I'd allow my child to do that, but she's an Honors student and gets all A's and a B here and there. Plus we didn't cave to the elaborate Sweet 16 birthday bash that's so popular, so I'm making it up to her by giving her some extra indulgences. That and I'm pretty much a push over. Yep. Anyway... I'm actually jealous of my own child getting away to the beach this weekend. How sad is that? This weekend marks the official beginning of the summer in New Jersey. YES! 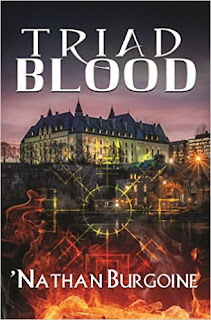 I absolutely going to the RWA signing... didn't know about the book blogger bash though?! Is there an invitation to that?